Let's get this out of the way - there isn't all that much driving in Drive, at least not of the sort promised by a film about an unnamed mechanic and stunt driver (Ryan Gosling) who moonlights as a wheelman-for-hire. He's an agent of shadow, not a speed junkie, who clings to anonymity as a sound strategy for survival. His favored vehicle is the one that will blend in the most. He utters, at most, a few pages worth of dialogue. It's a part that fits the luggish, taciturn Gosling like a second skin, a electrifying performance that's made in the subtle manipulations of his supine temperament. As such, Gosling stands out as the only element of Drive that's not crying out for attention. Luckily it deserves every ounce of attentiveness its audience is willing to give. Drive is a film that communicates through mood rather than plot. Combining expressionistic visuals with an angular synth score that evokes Risky Business and Chariots of Fire, director Nicolas Winding Refn lends a bit of magic to the mundane and suggests a timelessness in the film's examination of what compels people to endure risk to their lives, their hearts, and their identities. 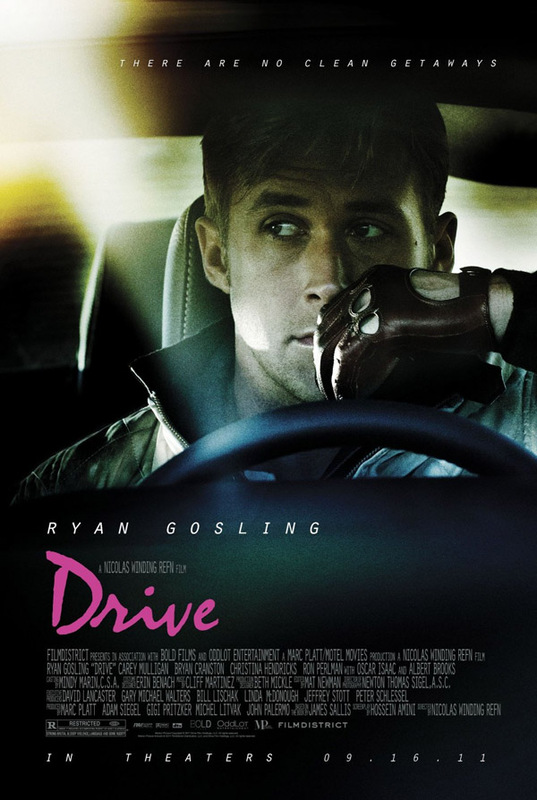 In this sense, "drive" refers not to Gosling's occupation but his raison d'etre, his intractable nature that strictly governs his choices but leaves more than enough tolerance for uncertainty. Such is his dalliance with Carey Mulligan, the loyal wife of jailbird Oscar Isaac, that also sets the gears of the story in motion. Though Isaac returns before anything untoward can happen between the new romantic pairing, Gosling's affinity for Mulligan and her young family pushes him deeper into the Los Angeles criminal underground that he's worked so diligently to keep at arm's length. Here Drive hammers home the loneliness and impersonality of Gosling's labors, as he seems duty bound not to fight for a love of his own, but to fight on behalf of love in general. Drive is as much a genre film as it is an oblique commentary on the archetypal quest narrative of a Clint Eastwood-style stoic. It has the requisite cuddly mentor in Bryan Cranston's wizened mechanic/capo and a stylish, against-type turn by Albert Brooks as a weary crime boss who commits violence with the same resignation he projects in corralling his uncouth partner played by Ron Perlman. There's also plenty of Refn's trademark gore, often accompanied by his incongruously heroic use of slow motion, smash cuts, and the pulsating soundtrack. But don't get the wrong impression - thanks to Gosling, the movie is decidedly laconic, a slow-burning powder keg that compresses tension to a fine point and releases it in exhilarating, symbolic bursts of action. Most decent movies have to strain to make even one shot or sequence feel iconic. Refn's effortless combination of restraint and release, as well as the film's complex understanding of human motivation, guides Drive toward a poetic perfection. Let other films worry about delivering action beats and star-driven fireworks - Drive's triumph is in its substitution of horsepower with humanity. I actually had a guy cheering and fist-pumping two seats next to me during the elevator scene. It must have been his second or third time seeing it because he was twisting and turning in his seat before it went down.